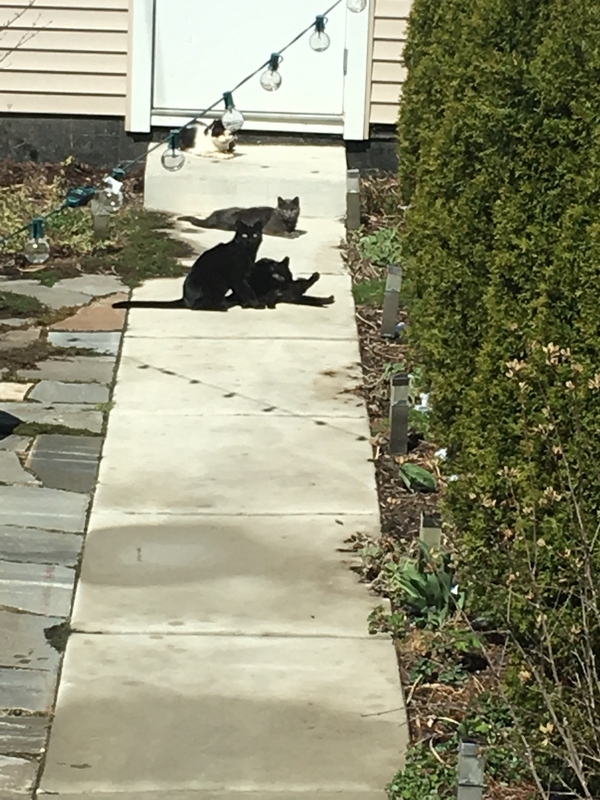 Today we watched this mama cat move her kittens around from an abandoned garage, to outside of a basement, and back again. Joann and I talked to the restaurant owner who feeds the cats, other neighbors, and the grocery store owner where some of the kittens are now. 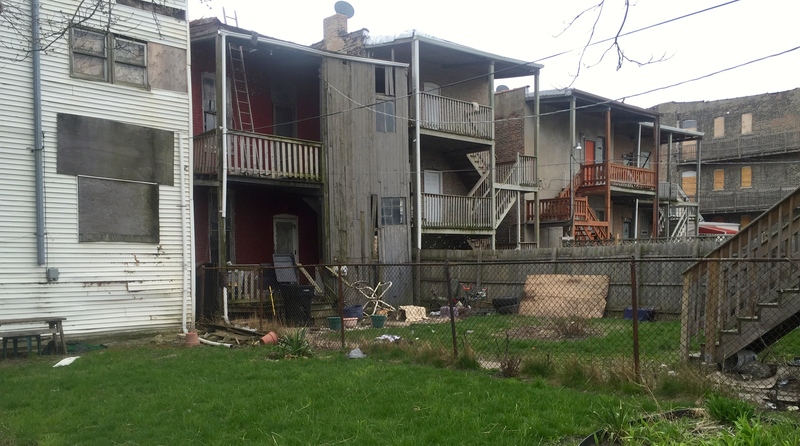 There are estimates of up to 12 kittens within these three buildings. 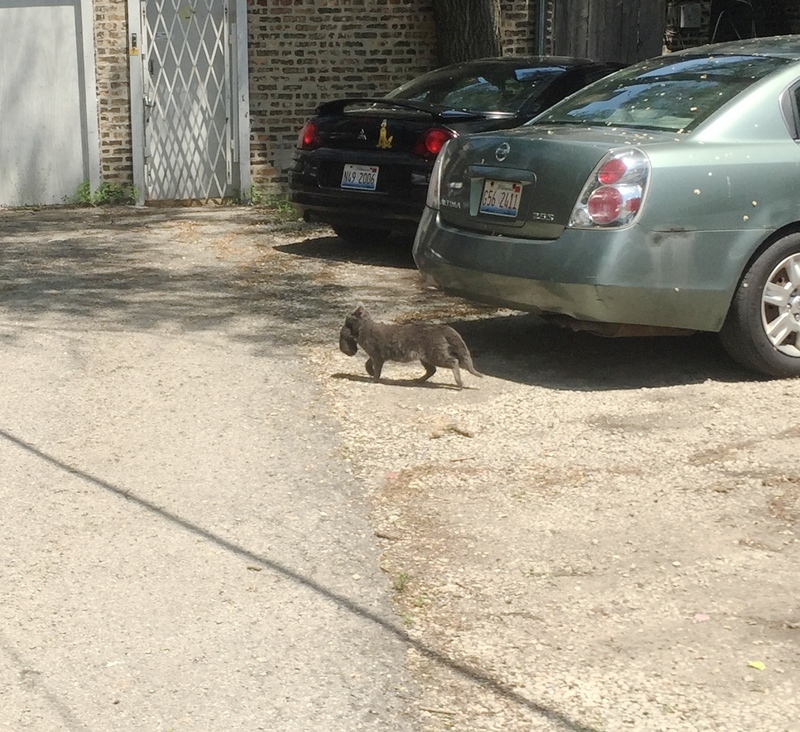 There are more mama cats, who keep moving their kittens around because there’s a lot of activity in this alley. Cats were fighting in the garage where the kittens initially were. Children have found the kittens and tried to play with them. A group of drunk homeless men keep coming by and want to sell them. Things like that. 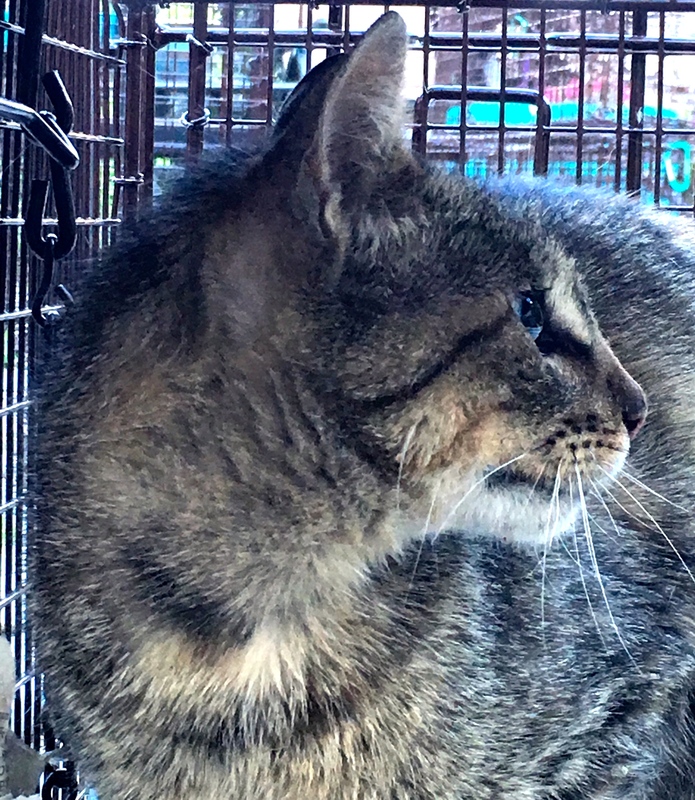 It was pretty overwhelming, because we spent all day today to check on traps and clean them, transport cats to the spay/neuter clinic, care for cats in traps, and take two cats needing care from a full service vet, costing $661. Just yesterday we managed to get six kittens off the street – they all went to our friend Robin’s home to foster. She is amazing. Kim managed to adopt out two other kittens from here just last week. When we saw there were even more kittens we couldn’t believe it. And there is nothing we could do for them now – they are too little and need to stay with their mamas. 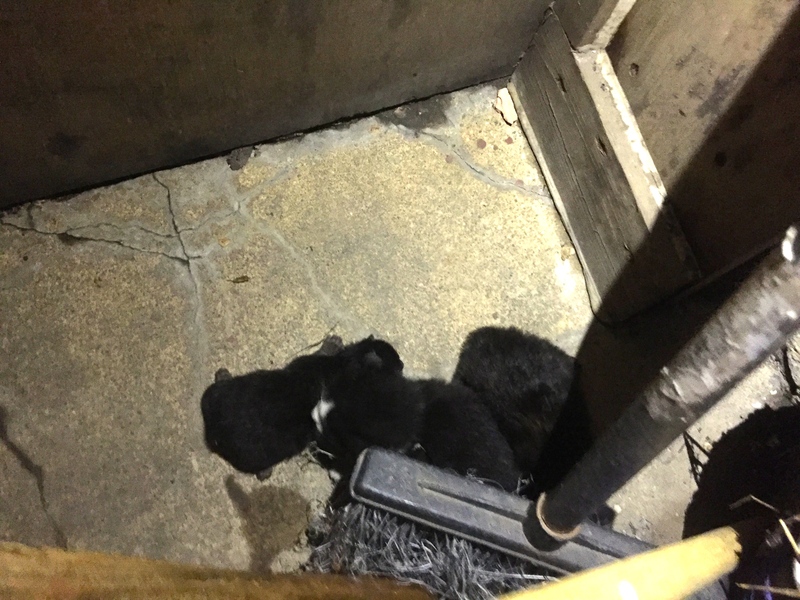 We found part of one litter in this basement. We’re going to try to bring some shelters to entice the mama to stay there. Please contact us in the link at the header of this page if you’d like to assist with this project. Thanks! Kim and Joann trapped last week with great success: fifteen cats and kittens trapped so far, and there’s a lot more. Kim reached out to me this year about her neighborhood. 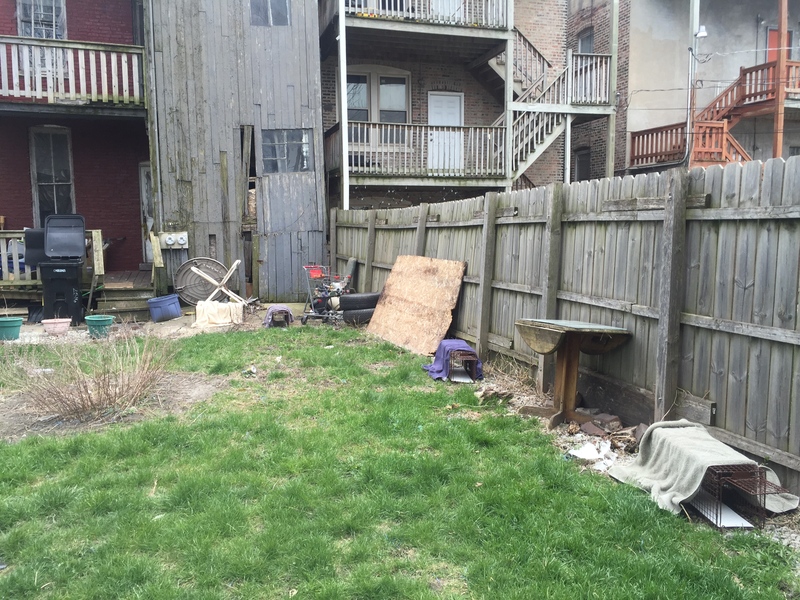 Joann and Kim started trapping and working through her area in Avondale last week. Kim trapped two kittens and a male feral cat. Once the kittens were spayed/neutered, the feeder adopted them into her home. 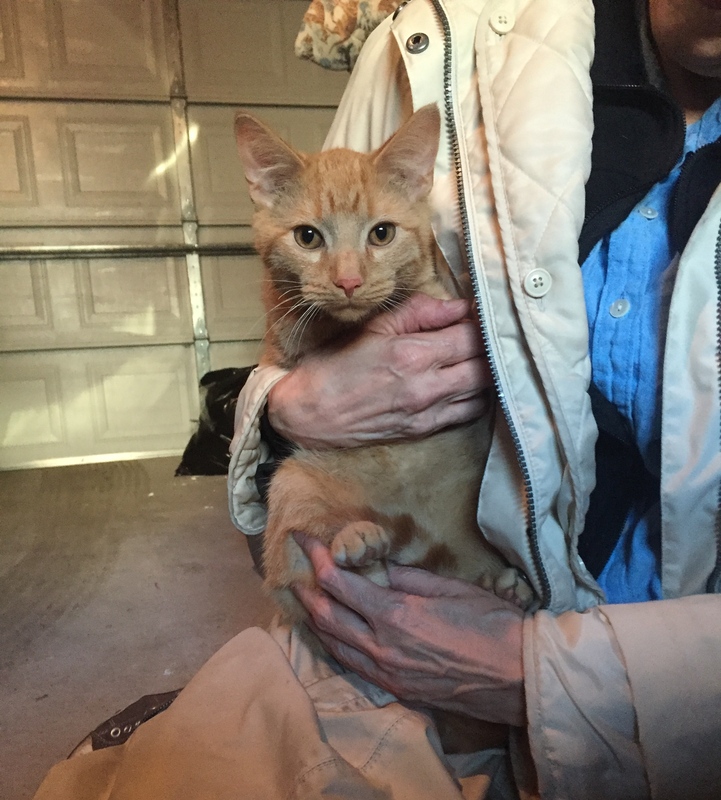 The male feral cat was TNReturned outside. She also trapped a sick cat that visited her yard sporadically. She has been trying to trap him for over a year, and believes he finally went in the trap because he was so sick. She called him Big Daddy, and the colony is named in his honor. Big Daddy was taken to Roscoe Village Animal Hospital, where after a thorough examination and tests, they all made the hard decision to humanely euthanize him because he was just too sick. RIP Big Daddy. Joann trapped along with Kim throughout the neighborhood and saw a lot of cats and talked to a lot of feeders. 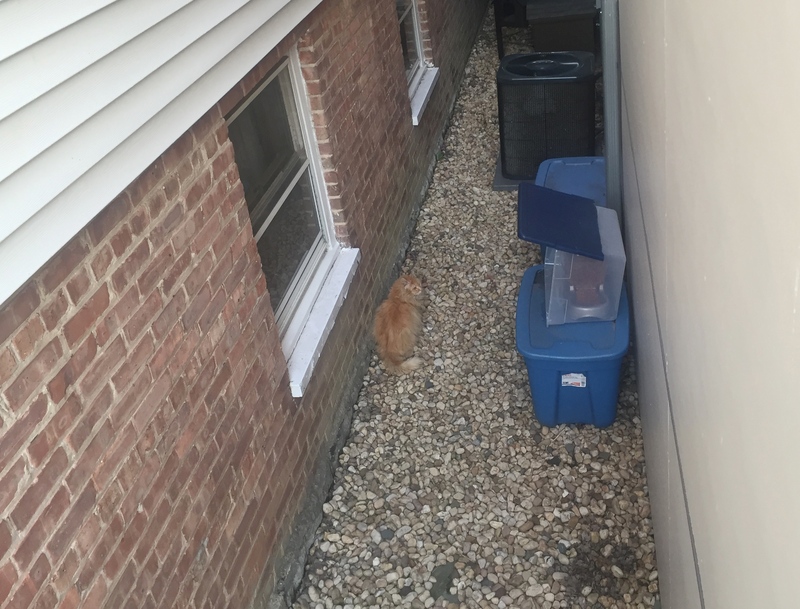 Some TNR was done here before by Erica from PAWS Chicago and other volunteers, because they saw a mix of ear tipped and non-ear tipped cats. Kim has also trapped 22 cats visiting her yard in the past two years. They trapped this beautiful TNR’d cat a few times, who also loves to pose. Her name is Georgita. And a lot of non-ear tipped cats. A lot of these cats are fed by a man named George. George feeds these cats no matter what, and also tries to impede trapping. He moved the traps, closed them, and did everything he could to stop them. George is an outdoor hoarder and there’s nothing we can do but to work around him and wait until he leaves. Joann and Kim also discovered that this restaurant feeds other cats. 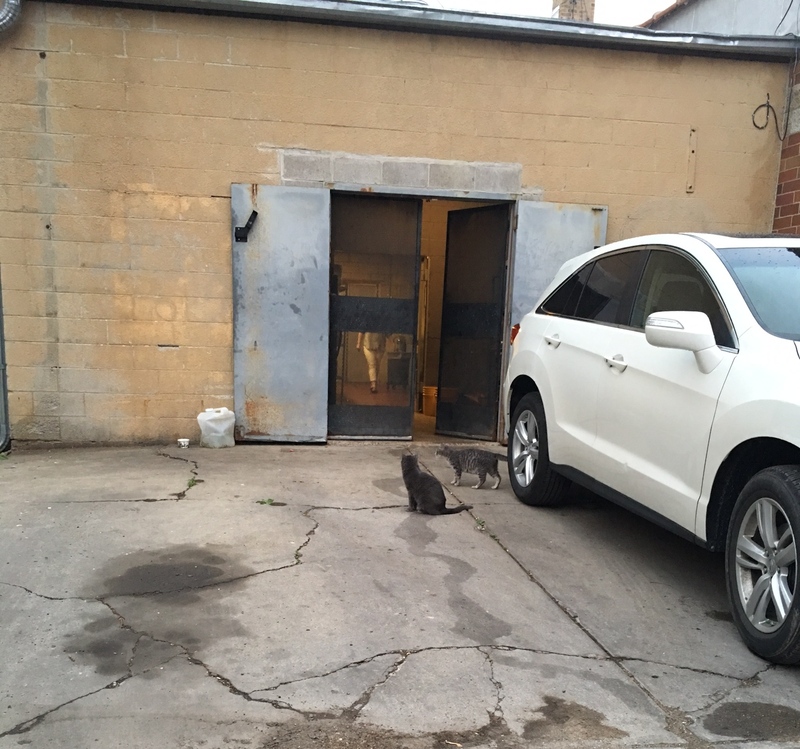 Check out these cats waiting for their dinner in back! The restaurant employees and several people throughout the neighborhood were all for TNR. 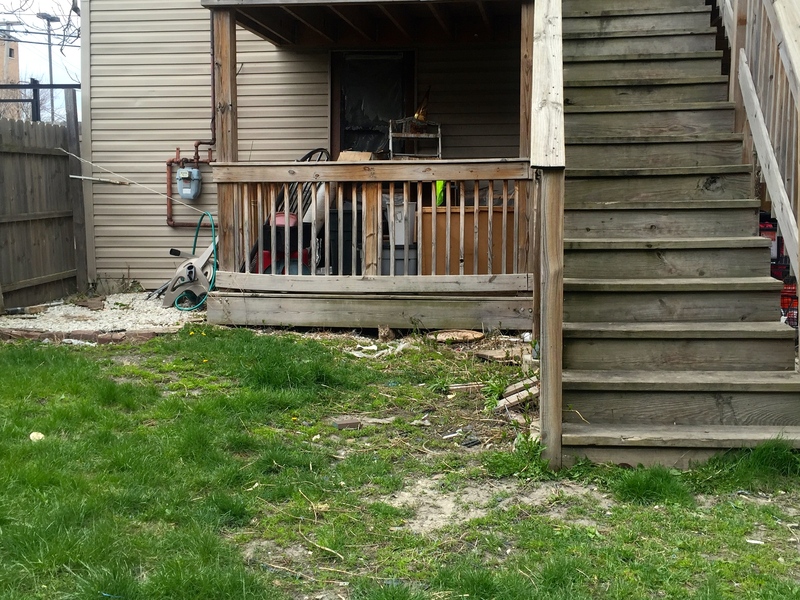 Joann and Kim talked to a lot of neighbors and found out a lot of people feed and were concerned for the cats. 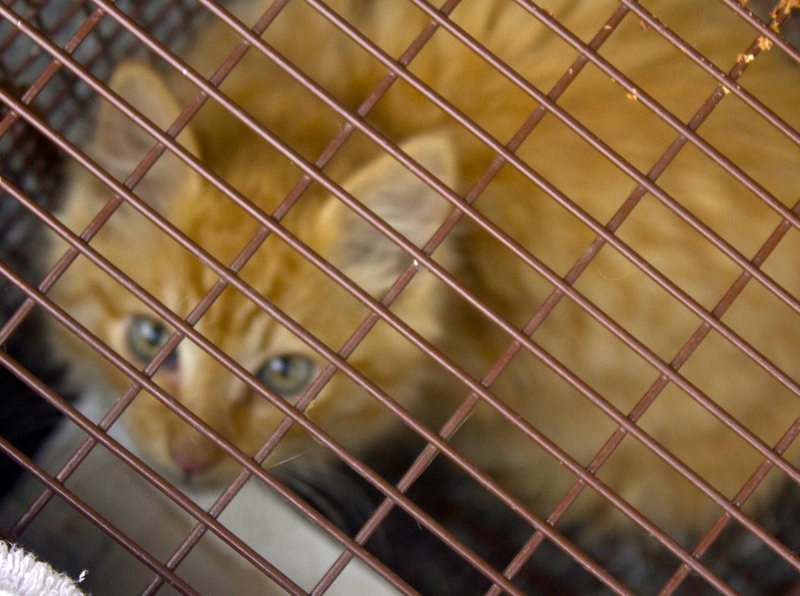 TNR always involves community outreach, and more people that live in this area need to help trap. They also discovered a few other hot spots that we are hoping to work on, with colonies of 10-12 cats. In all, Kim has estimated there may be up to 50 cats within these few blocks. They trapped in a few people’s yards and near where George feeds. 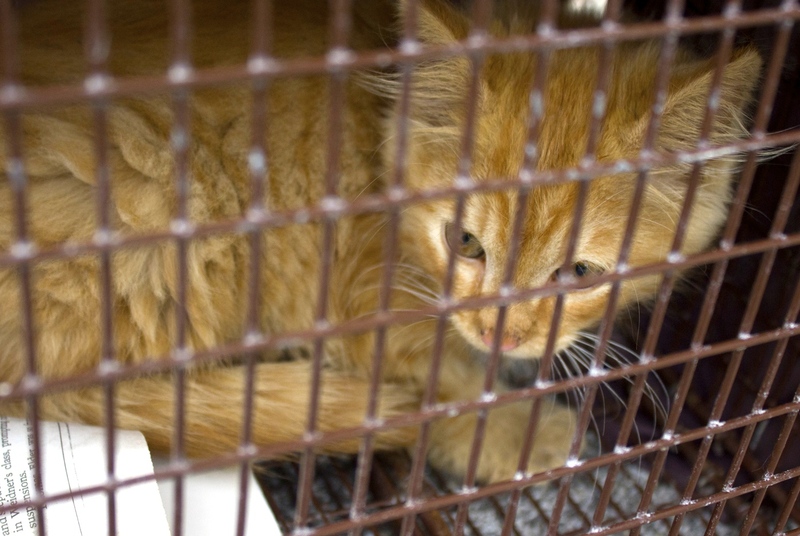 So despite his ongoing efforts to stop them from trapping, they trapped eleven more cats and kittens. That means these cats are hungry. They range in all kinds of ages and litters. All of these cats are currently at PAWS’ clinic for TNR surgery. Some of these orange cats look absolutely identical. 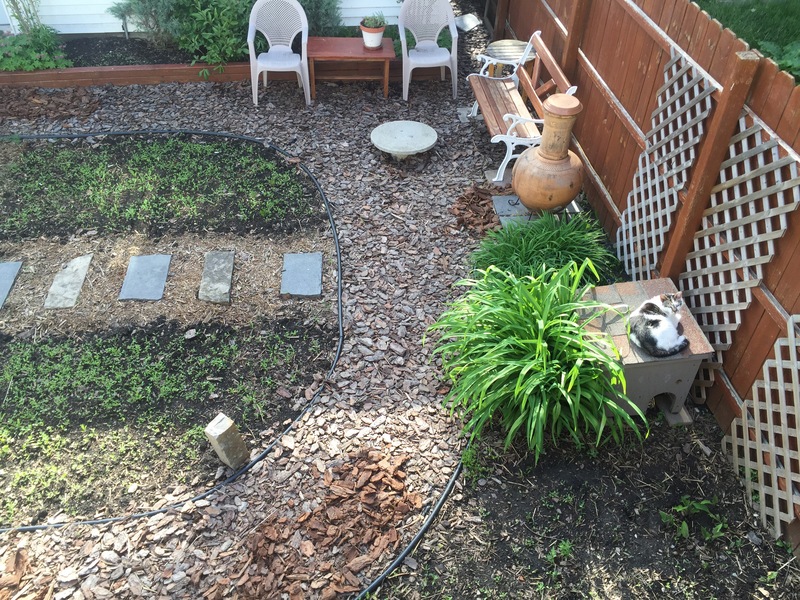 How Does Your Feral Garden Grow? Funny Face is napping the day away in my yard. A few weeks ago I planted seeds for a butterfly and hummingbird garden on the left, and a wildflower garden on the right. Both are a seed mixture of annual and perennial flowers. The rain brought a carpet of green that will hopefully grow into flowers soon. I’m glad to see Funny Face relaxing again. He was trapped in my yard by accident the other night, and of course he was pretty upset by the whole experience. 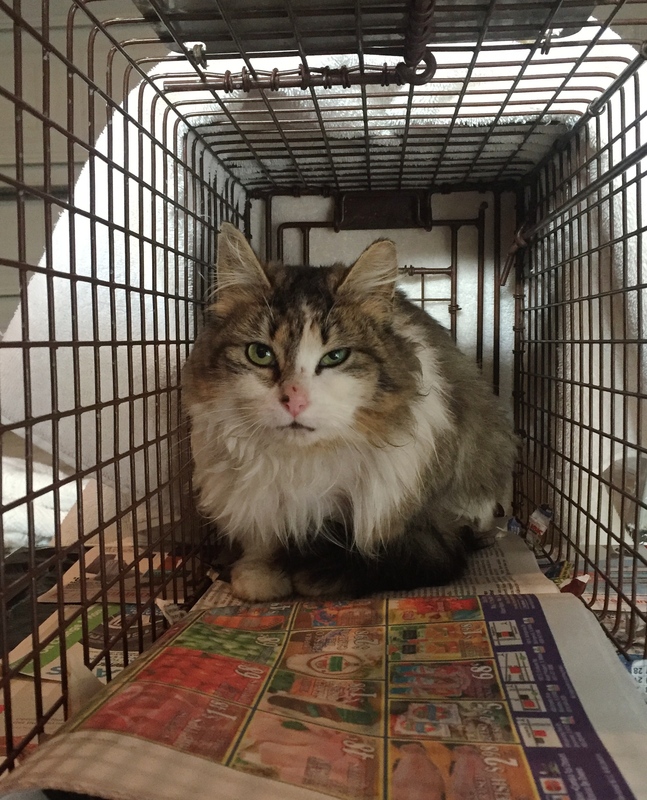 I have traps set for Puffy, another feral cat who needs some grooming. I’m also experimenting with this WordPress app so that I can blog from anywhere, anytime. It seems pretty easy and user friendly so far. 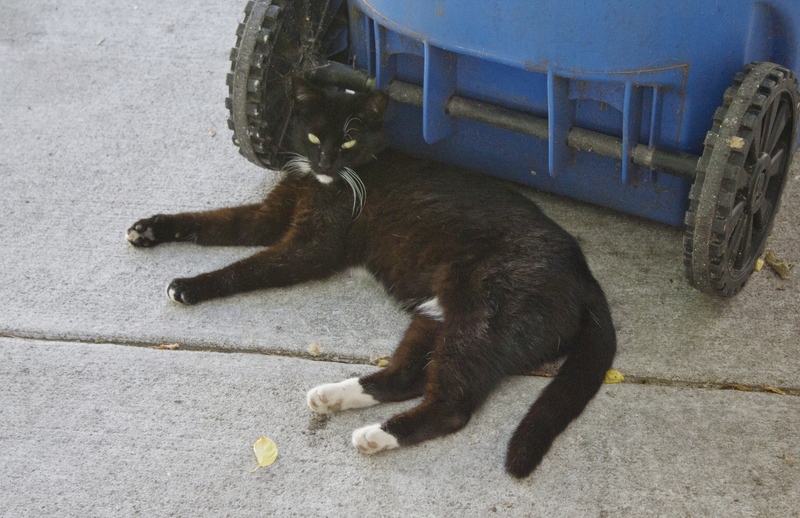 Caring for feral cat colonies means continuing to TNR any new intact cats that show up. That’s the basis of colony management for all caregivers. Kim V. has been caring for her Big Daddy Colony in Avondale for years. She TNR’d about a dozen cats there so far. Most of them hang out in her yard. 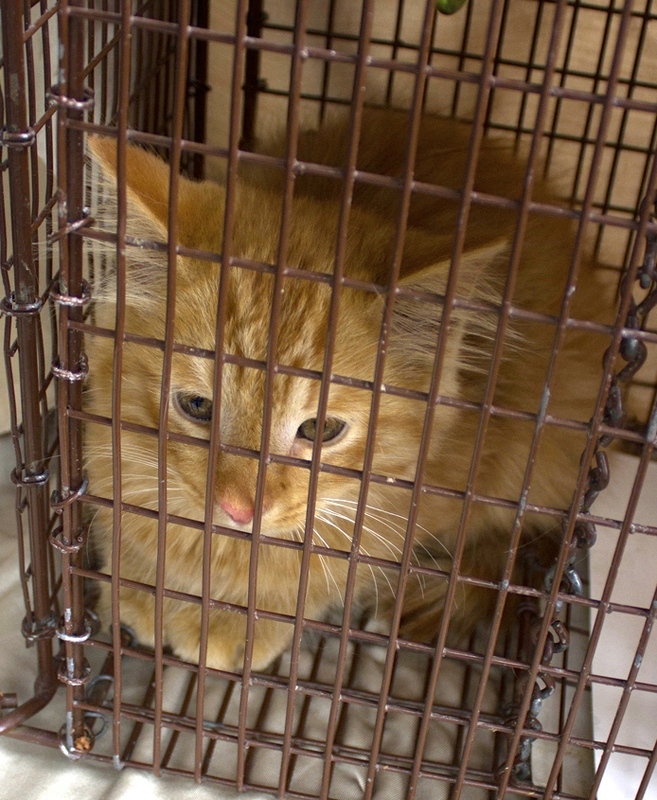 She contacted us to borrow traps for a few cats still needing TNR and additional medical care. 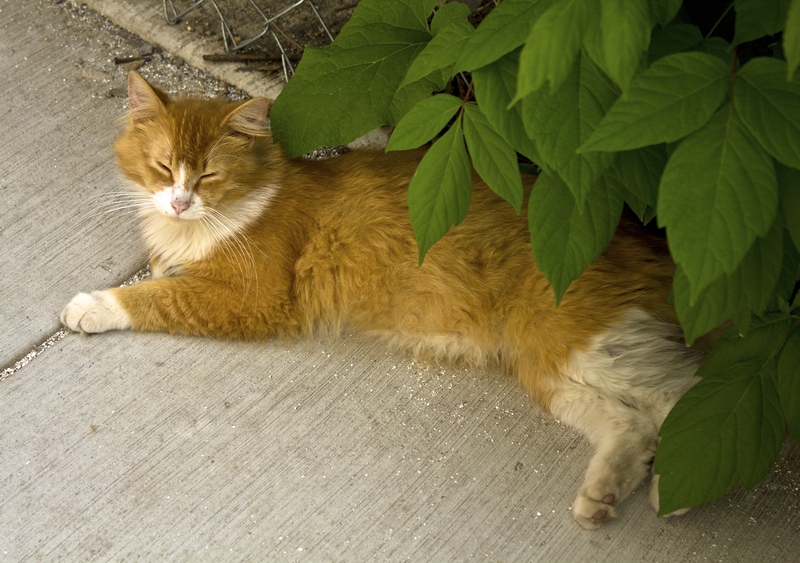 Specifically this orange cat, who needs to be neutered and shaved. We dropped off a dozen traps at her home a few weeks ago. Her indoor rescue cats made sure to investigate. As soon as she set the traps cats came to investigate. So far she has TNR’d two new intact males this month. She is still trying to trap the orange cat and another cat that appears to be sick. She is also pretty sure there is a black kitten down the block from her. In the meantime she also trapped several ear tipped cats, so having the extra traps came in handy. Some cats will go in traps over and over again. 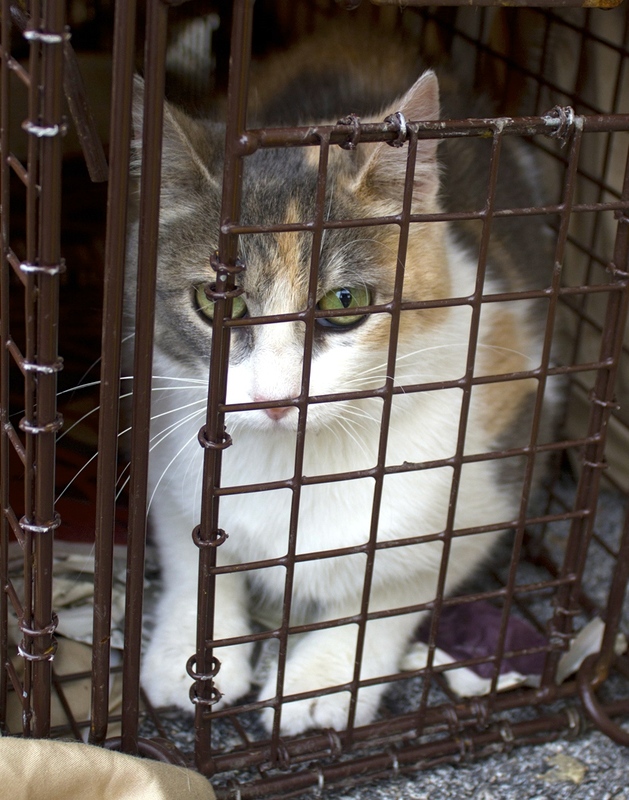 When you need to trap specific cats from your colony for TNR or for ongoing medical care, it’s easier to have a trap set for every cat you may have. 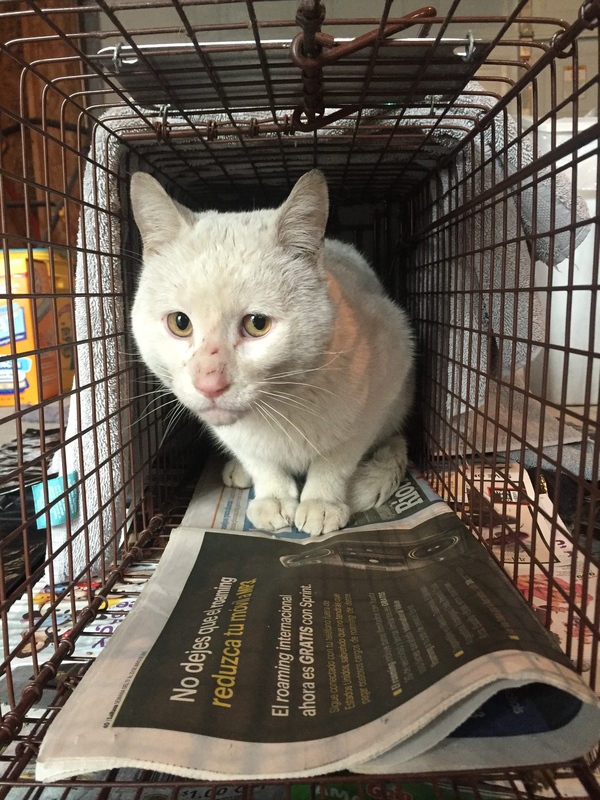 When you trap your TNR’d cats that don’t need to be taken to the clinic, you can set them safely to the side with their own bowl of food in a safe place and keep on trapping for the ones you want. This process works. It also works just to help trap a colony needing TNR at once. 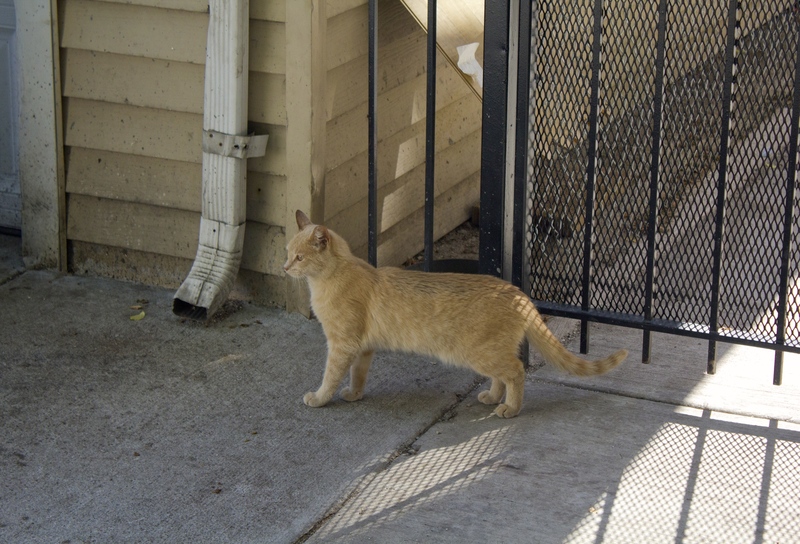 Very few colony caregivers just care for a cat or two in the city – most colonies are bigger than that and it’s easier to trap them together at the same time. I bought a bunch of traps for that very reason years ago, and am happy to lend them out to help people. Kim V. contacted me through a mutual friend. 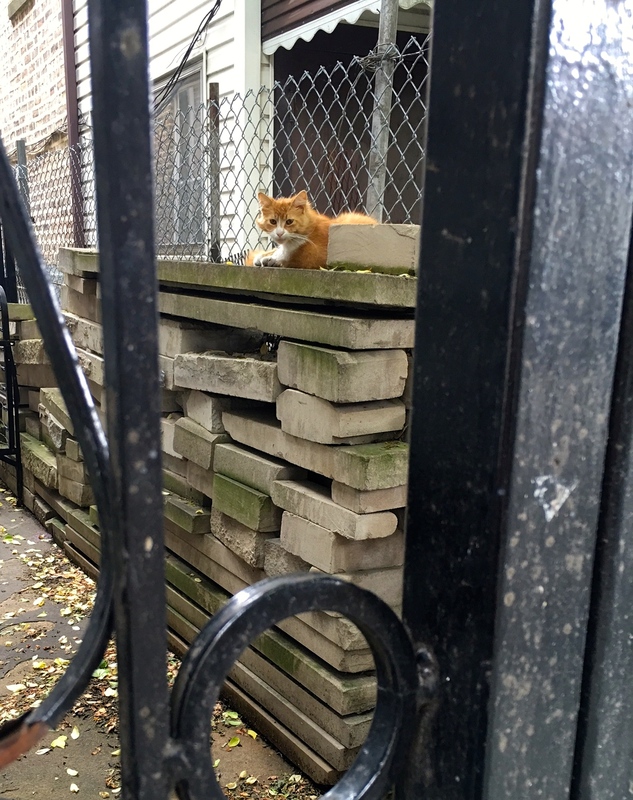 She has done TNR for almost 20 years, starting in Logan Square off of the Boulevard, taking in cats to a regular vet because low-cost clinics for TNR weren’t available at the time. 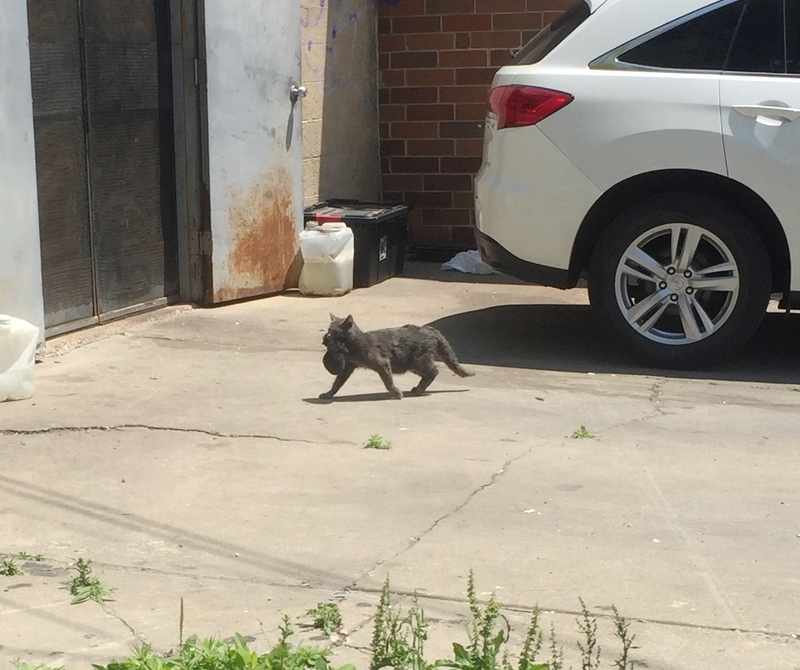 She is now in Avondale, caring for about 12+ cats, most of them TNR’d. 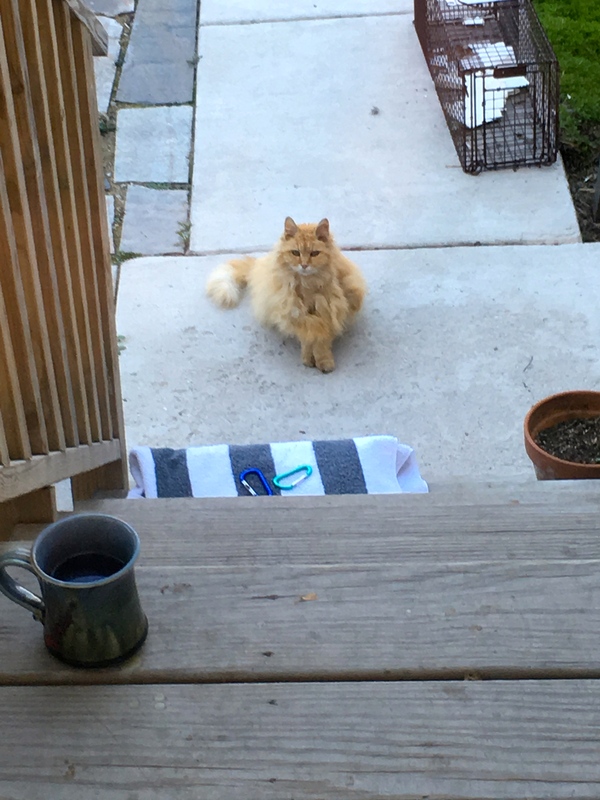 But there are a few intact cats still outside, and a few sick cats that she wants to take in to a clinic or vet, including this matted orange cat. Now is the perfect time of year to get him groomed. 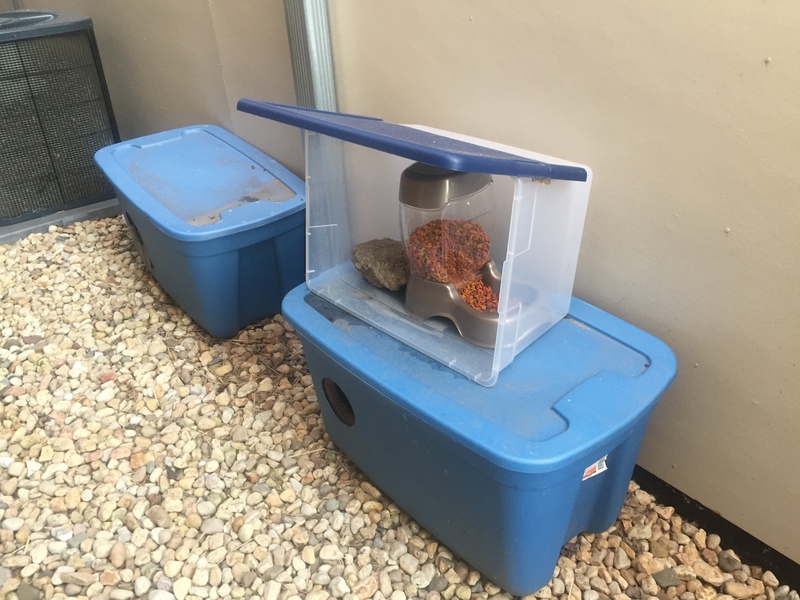 Her colony is well cared for, with outdoor cat shelters made out of Rubbermaid storage bins, and feeding stations. 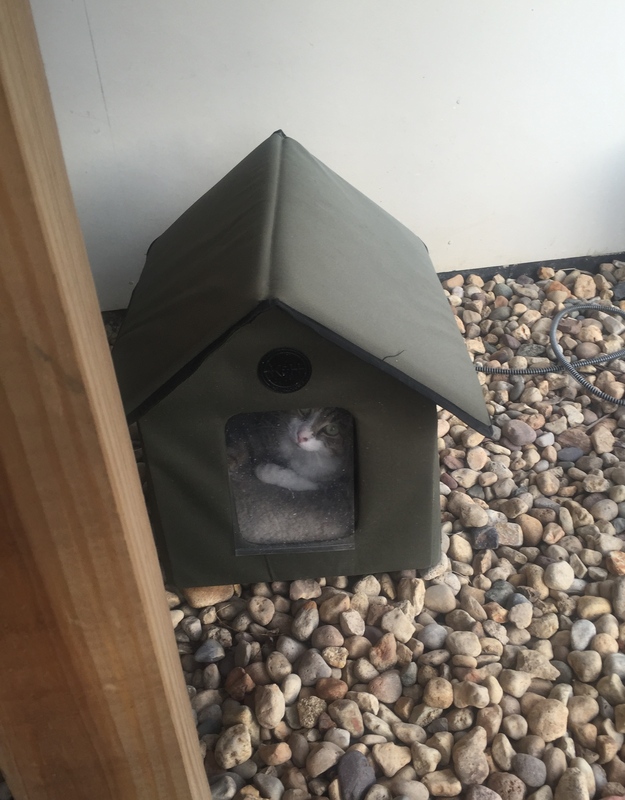 She also has heated outdoor cat shelters. This smart cat is always in one. We are confident Kim will trap the cats she wants for the clinic! We trapped again at the Pallet Colony this week. As usual with TNR, there were a few surprises. But we think now we have a good relationship to make this an established, well cared for colony. One of the places that feeds the cats there is an assisted living center. In preparation for trapping, Joann called to let them know to stop feeding. They told us they brought in a cat from outside and wanted us to take him. Joann went to collect the cat and had no idea what to expect. 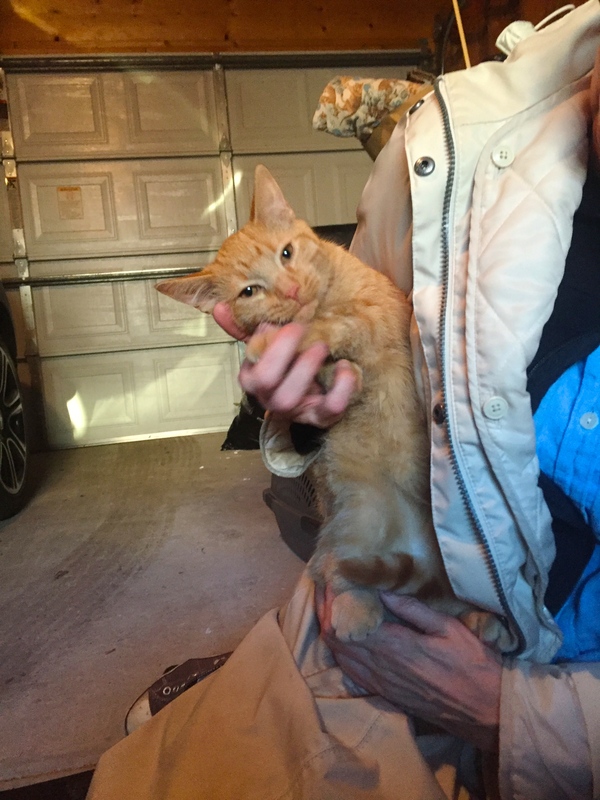 It turned out an employee brought this cat from her home in Indiana and had him waiting in her car all day, without a carrier. This employee has two mama cats at home with two litters of kittens, seven weeks old and two weeks old. Sanderson showed up from outside her house and wanted to nurse on one of the mama cats. She didn’t want this cat, so she thought we would take him. Well, of course we did, because this woman did not have any other plans for this cat otherwise. It was a total coincidence that Joann called even that same day. Thank goodness Sanderson turned out to be a friendly, healthy love bug. Just look at him. Had he been feral, we would have had nowhere to return him. He is a purring machine that begged for attention. He spent the night here and when PAWS Chicago met him, they agreed to admit him into their adoption program. Thank you, PAWS! 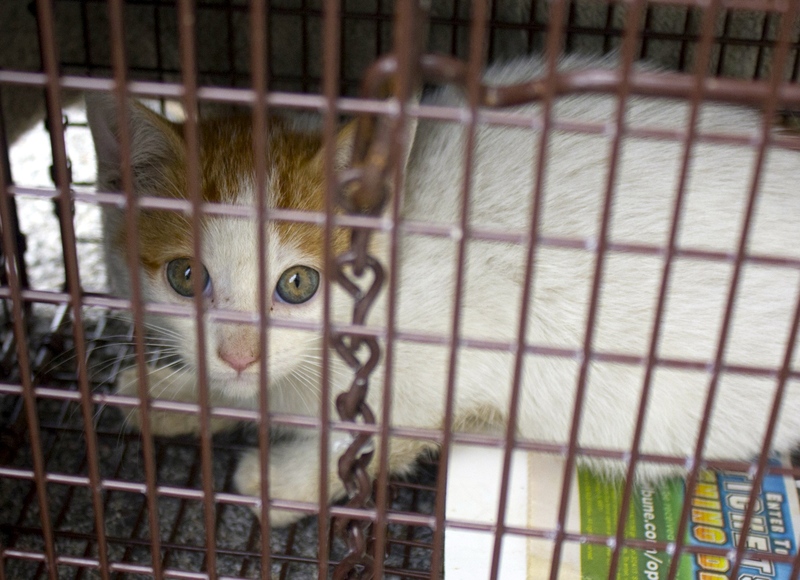 We have trapped 20 cats so far at this colony site. Nine of those cats and kittens were admitted to PAWS. Sanderson is the 10th cat admitted for adoption, although obviously he is not really from this colony. We know he’ll be adopted in two seconds. We all fell in love with him. This cat was cooped up all day in a car, and was absolutely fine – just wanted us to hold him and not be left alone again. We are also working with PAWS to help counsel this employee and find help for the rest of the animals in her house. Right now she does not want them spayed and neutered – she believes every animal should have two litters first. This is where community outreach is crucial while you are doing TNR. Obviously people cannot just bring us animals and expect us to take them. We totally lucked out with getting Sanderson admitted. Joann also called Ron, another feeder on that block, to tell him to stop feeding so that we could trap cats. Ron feeds the cats and they hang out in his yard and the other yards because there are tons of places for them to hide and find shelter. They climb in and around all of those porches. Ron also has some sort of substance abuse problem. Anyone who does TNR regularly has dealt with stuff like this. I’ve dealt with it before, and in this case, I’m just happy he doesn’t have cats in his house. Those situations turn into hoarder houses a lot of times. 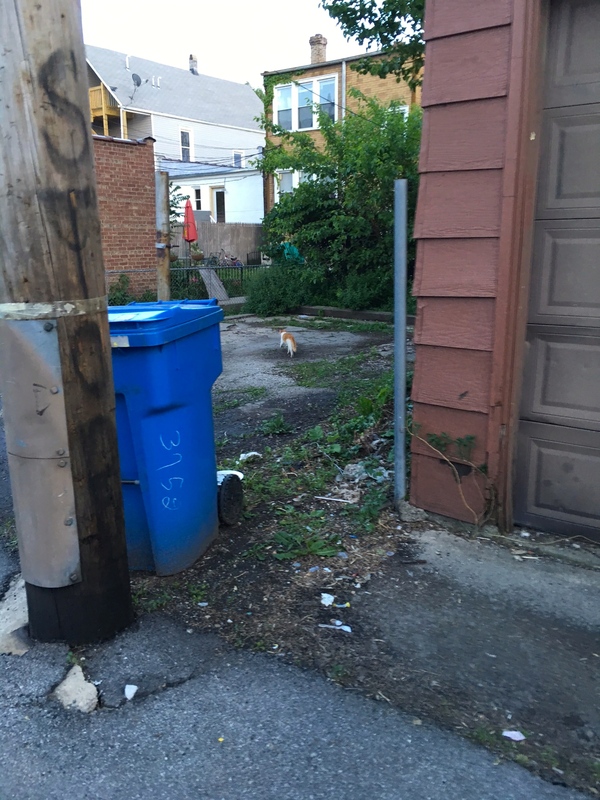 There are usually a lot of cats in low income neighborhoods and lots of people feed them. We do the best to help, but personal safety is paramount. Ron asks for money each time we come, and we’ve complied and given him donations of cat food as well. He also has a lot of other men show up randomly at his house. Yesterday was no exception. We set up traps all over the assisted living center, and in Ron’s yard. Immediately the cats started poking their head out from underneath his porch. We have TNR’d a lot of the cats there already, but we wanted to see if we can get any more that we may have missed. In the meantime, one of Ron’s visitors had a lot to say about how we were trapping. He wanted us to bring him food and drinks. He had his own plan to get the cats in the traps, but then he disappeared for awhile and did nothing. It was very obvious the cats were fed. They circled and played all around the traps for a few hours. We caught one ear tipped cat and released her. Some more people showed up periodically and randomly walked through the yard and in the alley where we were parked. We talked to each of them about what we were doing. I wish I had a high zoom video camera to tape the cats, they were pretty entertaining, but we didn’t get any new cats. When we started rounding up the traps to go home, three of Ron’s visitors came out. This time I felt nervous because I was alone in the gangway with them. The man who said we were doing it wrong showed me some cat food cans in his pocket, said he was going to get the cats, and asked when we were going to take them. He said he was going to keep them in crates. I had no idea what he was talking about as he was leaving in an entirely opposite direction, but I told him firmly that we were not coming back. I was scared he was going to do something with the cats otherwise, not hurt them on purpose or anything, but I have no intention of working out a plan with him. It was apparent that I had no say in these plans. But really, it’s doubtful he was going to do anything anyways. Instead, Joann and I are again working more with the assisted living center to set up a permanent feeding station and schedule for the cats in their secure and safe courtyard next door. We already provided them with outdoor cat shelters. Hopefully then these cats, and any new ones, can be cared for there. We want them to call us for help with new cats, or medical needs for existing cats. We are happy to donate cat food as well. 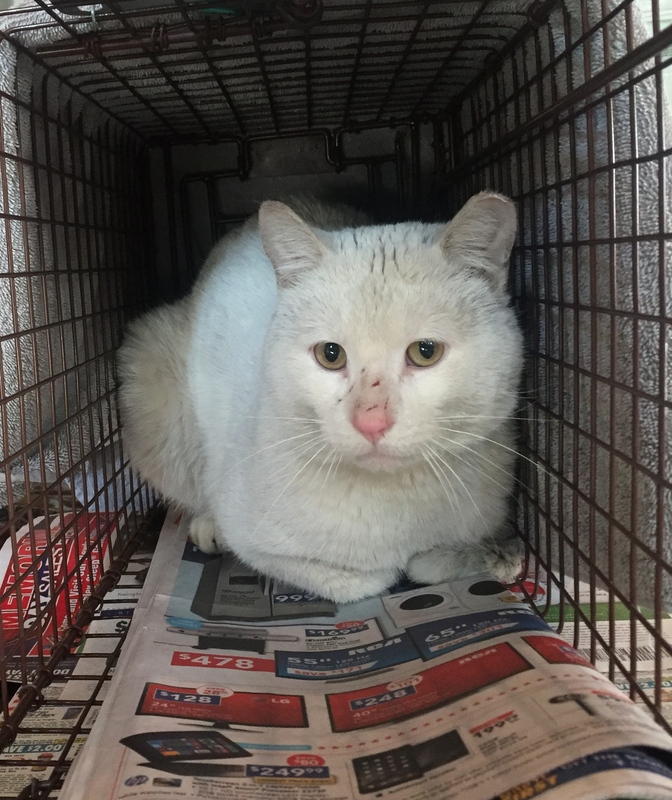 The residents and staff there really care for the cats and with a proper plan in place for colony management we are confident this can be accomplished. 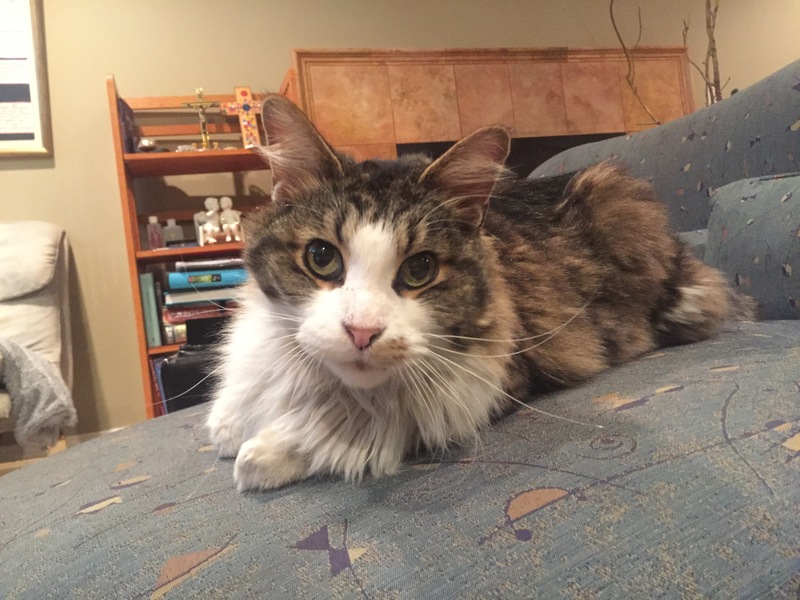 Nico, a long-haired declawed pet cat, ran out of his home on February 20th. Two weeks later I saw the lost cat fliers his owner, Katarina, put out in our neighborhood. Not only was Nico more in danger because he was declawed, but also because Katarina had moved into the neighborhood just two weeks before he got out. He was in unfamiliar territory. And Katarina wasn’t planning on staying long – she is moving out of this area again by the end of this month. 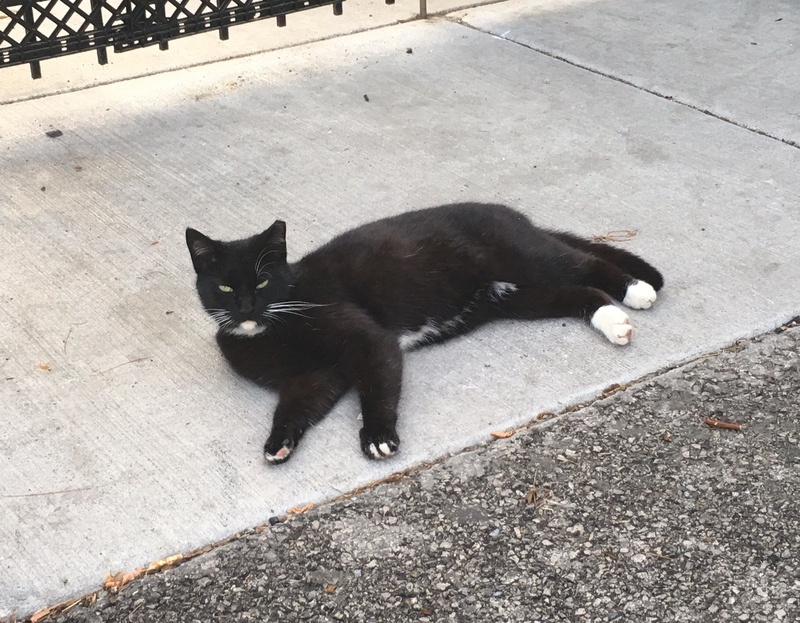 The good news is that there are TNR’d colonies in the area already, and neighbors in the past have been very responsive to lost cat fliers. 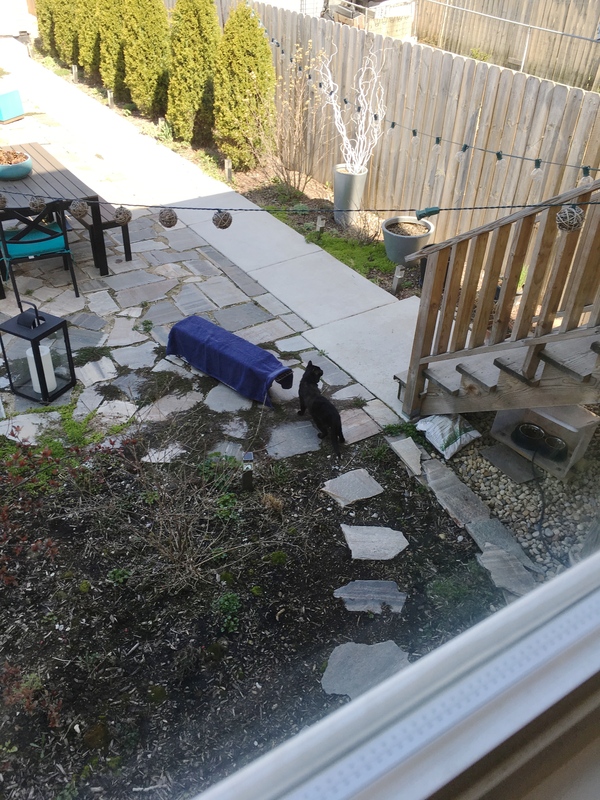 Katarina agreed to put traps in her yard to try to catch Nico, and to TNR any other cats that we trapped in the meantime. Katarina kept trapping an ear tipped black cat, which was a good sign. But she also trapped two intact cats right away. The first was Bailey. I have to include his “before TNR” photo because his expression is priceless. 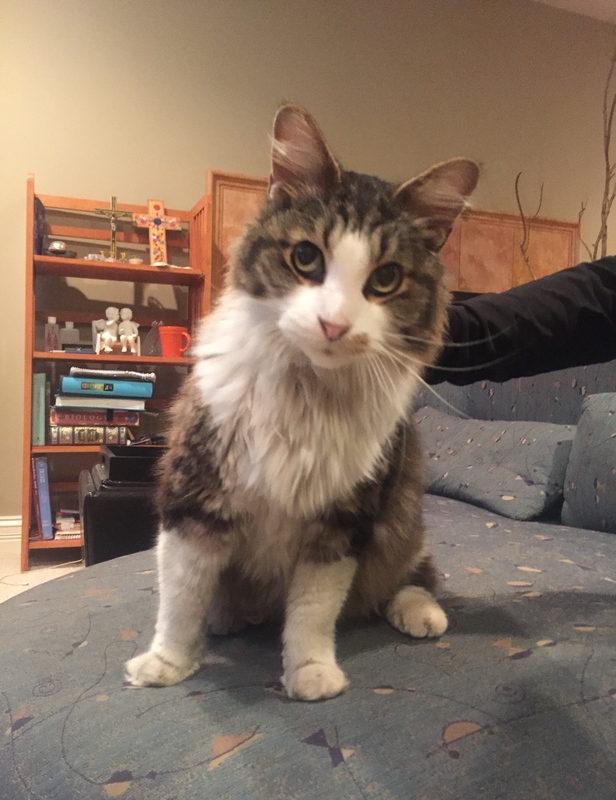 He is feral and cleaned up nicely with his new ear tip. Then she trapped Meredith, who just by coincidence looked a lot like Nico at first. She is also feral. She was TNReturned, and Katarina still sees these two cats here and there in her alley. Then for awhile, nothing happened, although Katarina set traps every night. She posted a lot of fliers, and received a lot of texts and calls with sightings. Meaghan, another neighbor, contacted me and offered to set traps in her yard. She started that this week. In the meantime, Katarina got a call from a neighbor the next block from her who said he saw Nico the other week. 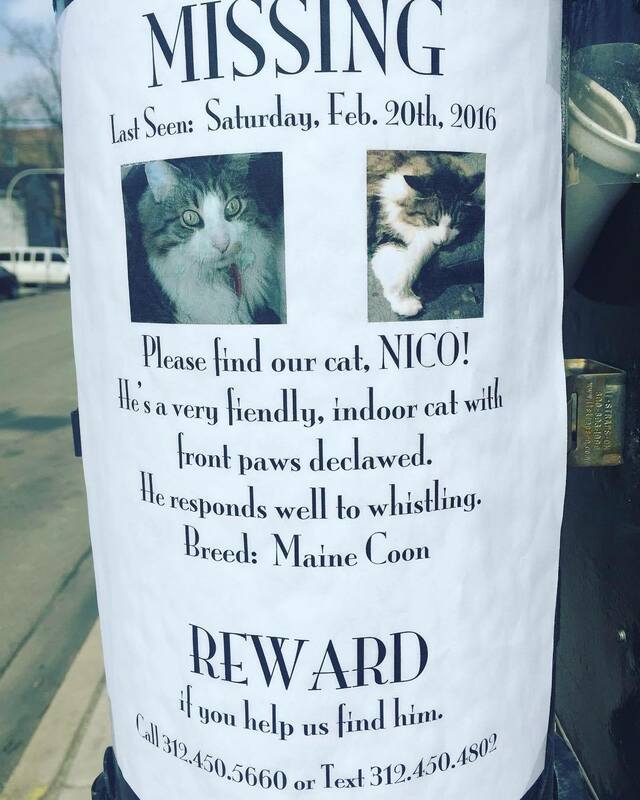 Then this week he saw fliers from a woman that said she found Nico. It turned out she lived in his same building, and Nico had followed her into her apartment on Sunday. They called Katarina and she brought him home today. He’s as friendly as ever, purring and wanting attention, responding to his name. Just look at that face. 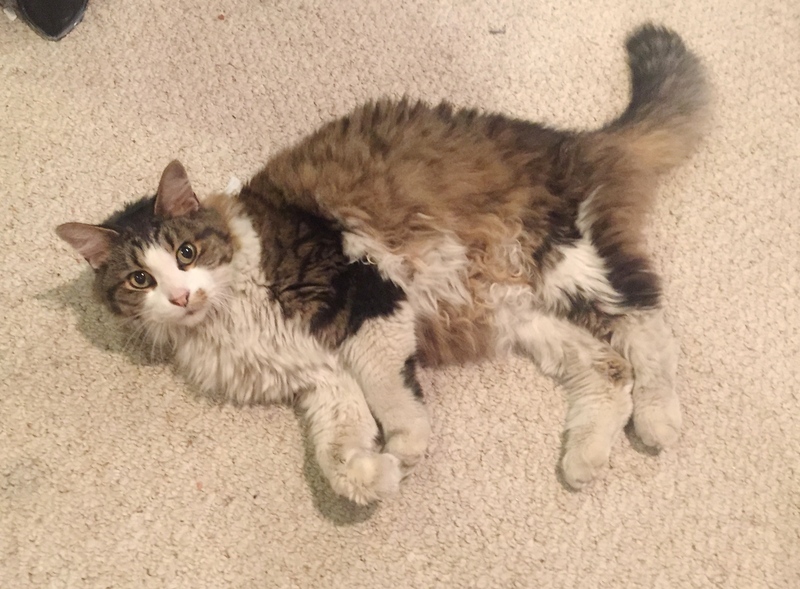 It’s hard to tell because he’s so fluffy, but he is definitely very skinny now, and a bit dirty and matted. Katarina is going to take him to a vet for a full check-up. It seems like he’s been outside this entire time. The neighbors think he may have found shelter underneath a tarp covering a boat next door to them. Who knows? But he’s a survivor and his story has a happy ending. 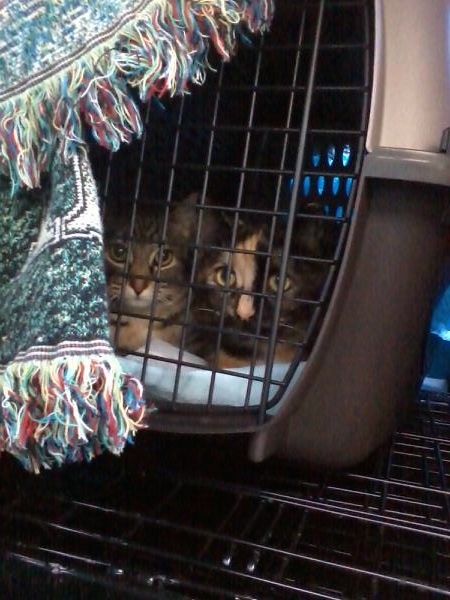 We are also so happy that in the meantime we were able to get two other cats who needed to be TNR’d and vetted. We also will continue trapping with Meaghan and any other interested neighbors to see if we can get any other cats in the area. 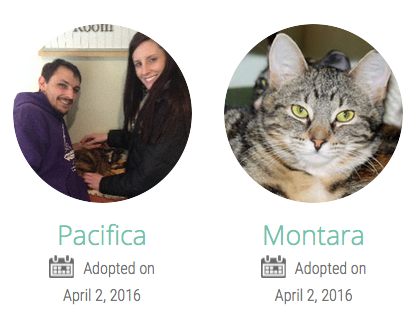 Pacifica and Montara spent about three weeks on PAWS’ adoption floor and are now adopted as of April 2nd. We’re not sure if they were adopted together, but we are ecstatic they are now safe indoors. We trapped them in January from outdoor drain pipes at the Pallet Colony. Joann refused to put them back outside, and worked hard socializing these cats. Robin also rose to the challenge and fostered them for awhile. 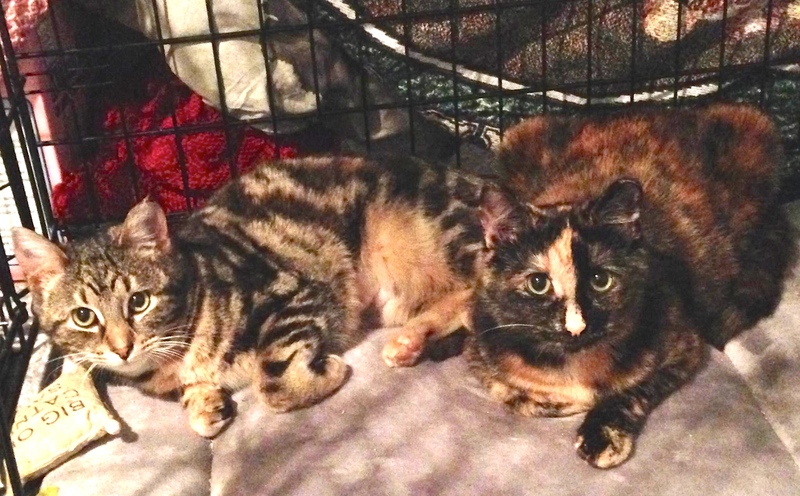 It is not easy socializing six month old cats, but these women showed it can be done. I am honored to be working with women like these in rescue. 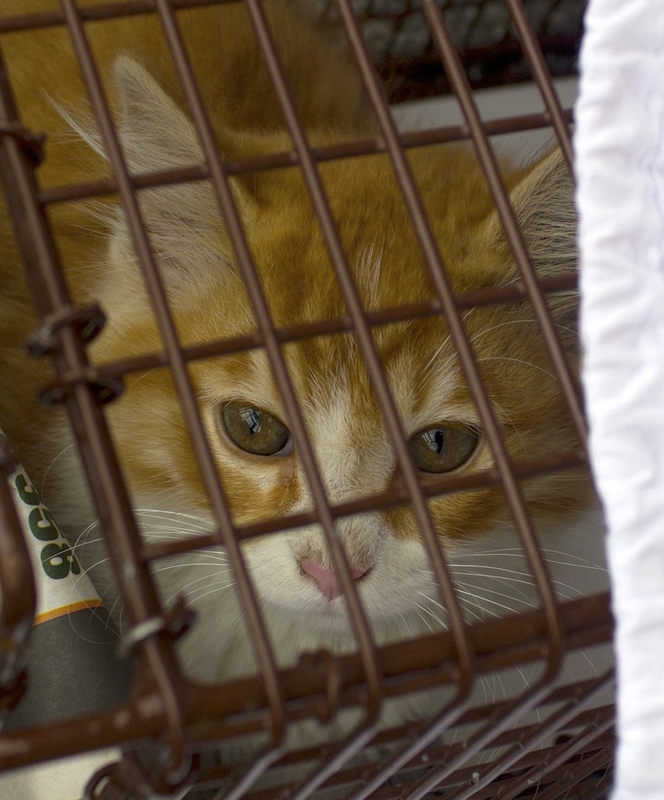 Joann and I are going back to the Pallet Colony site to trap any remaining cats next week. One of the residents there said there may be a twelve week old kitten. 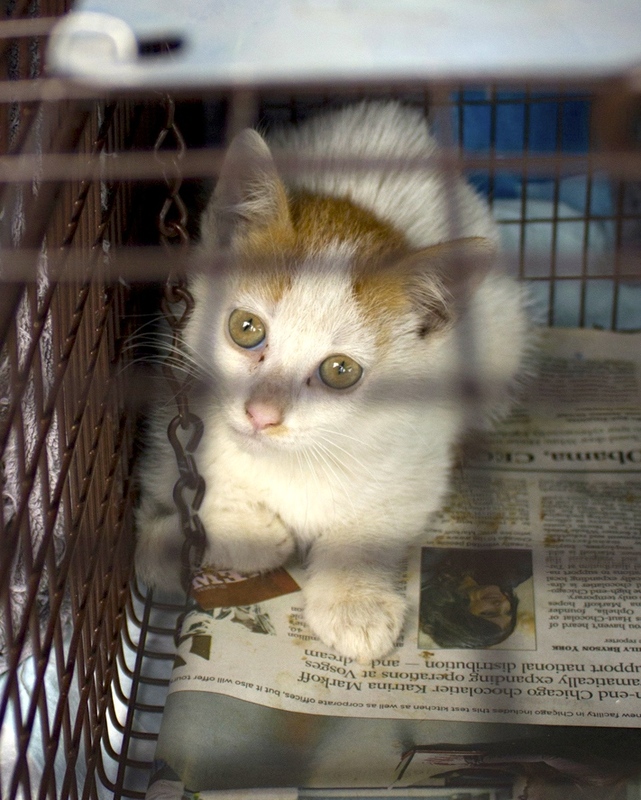 Otherwise, to date, we’ve trapped 20 cats there so far, nine of which were admitted into PAWS. I’m trying to socialize a cat I think is 6-12 months. She seems pretty keen on indoor life but is still terrified at the thought of sharing space with me. I fear it may be too late for her. Yes, sometimes socialization is not possible and doesn’t work out. Or it can take years. Twin Kittens from the Pallet Colony Adopted Together! 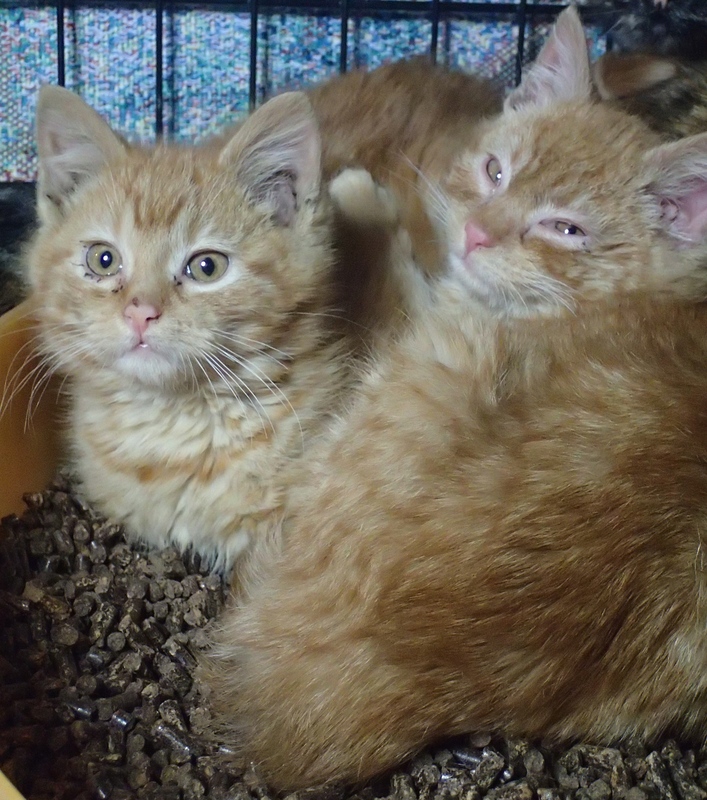 Getting bonded cats from the same colony and kittens from the same litter adopted into indoor homes TOGETHER is always a dream for animal rescuers. Joann and I were so excited to hear that these orange twin siblings, Hunky Dory and Stardust, went together into their new forever home, courtesy of PAWS Chicago. They were trapped together in mid-January. PAWS immediately admitted them into their no-kill shelter, but they needed some foster and medical care for their URI’s. 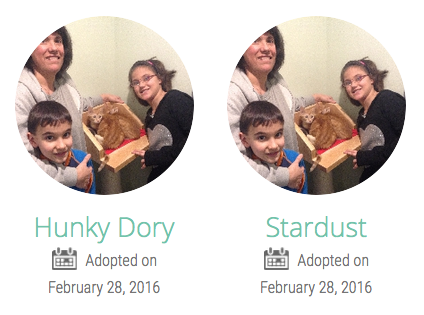 On February 27th they hit PAWS’ adoption floor, and were adopted together the very next day. Congratulations, Hunky Dory and Stardust! We trapped these kittens finding cover from the snow in outdoor drain pipes two months ago. Joann and Robin fostered them ever since. 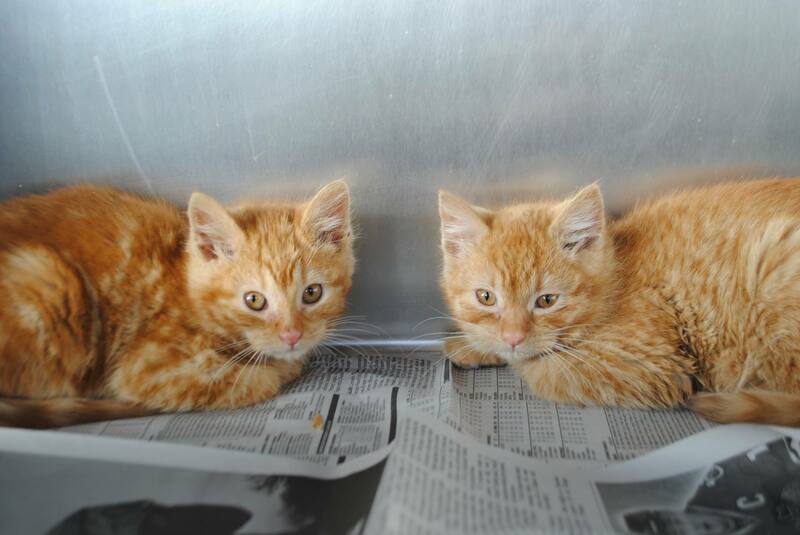 Pinky and the Brain are now admitted into PAWS Chicago! Their new names are Pacifica and Montara. Stay tuned for adoption updates about them. 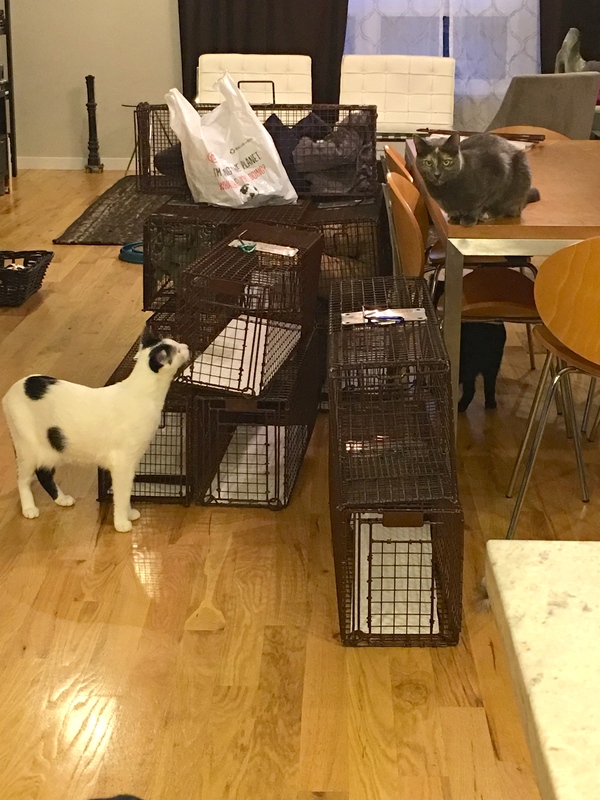 We trapped 20 cats so far from this colony, and PAWS admitted nine of them. There are more to be TNR’d, and we will be out there again trapping in April. Congratulations, kitties, we hope you’ll be adopted soon!